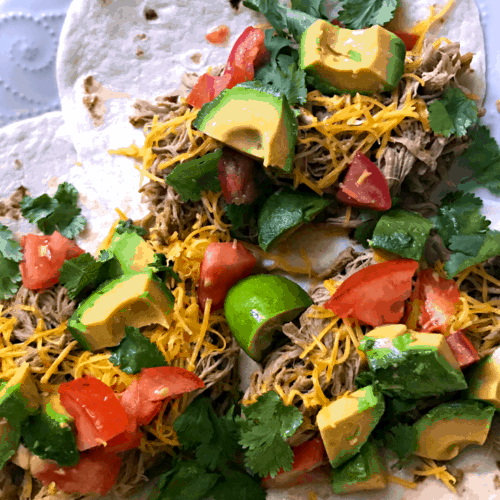 This Instant Pot Mexican Pulled Pork Tacos Recipe is one that I’ve made since the first week I bought my Instant Pot. Like many new IP owners, I was drawn in by the promise of easy, speedy dinners — but I didn’t know many recipes suitable for pressure cooking. Some things turned out horribly, like my attempt to make a huge pot of oatmeal which resulted in a gummy, tasteless mess. Honestly, it’s easier to make that on the stove. But I didn’t let that failure discourage me, and before long I was making beans, brown rice, and artichokes in my Instant Pot. After practicing with those foods, I felt comfortable enough trying something bigger and more, well, meaty. Since I had a case of gorgeous pork loins from Zaycon Fresh in the freezer, I decided to try my hand at making pulled Mexican-flavored pork in the Instant Pot. It turned out wonderfully and immediately became a family favorite. I’ve been making them pretty much every week since because we love them so much! 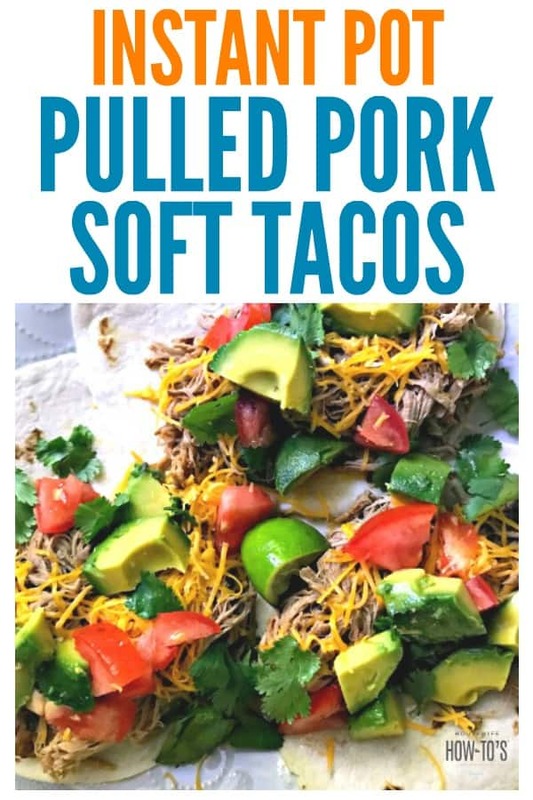 The other day, I decided to post a photo of my Instant Pot Pulled Pork Tacos on Instagram and in a few recipe-sharing groups that I belong to on Facebook. The number of requests for the recipe was overwhelming! So, even though these are just shots I took of my dinner plate while it was on the kitchen counter, I figured I’d go ahead and share it with you. Pardon the iPhone photos — I’m sure your meal will look even more lovely. This Instant Pot Mexican Pulled Pork freezes wonderfully, so if you have leftovers don’t fret. Pop them, with any remaining liquids from the bottom of the pot, into a resealable freezer bag. Be sure to squeeze out all the air before sealing and label the container. Defrost as-is in the refrigerator overnight or remove it from the bag to defrost in the microwave. An unbelievably EASY and DELICIOUS meal with just 5 minutes of prep required! Pour the water in the bottom of the Instant Pot. Rub the taco seasoning mix over every surface of the pork loin. Put the pork into the Instant Pot directly on the bottom (no rack) -- cut it in half if necessary to make it fit. Sprinkle any remaining taco seasoning over the pork. Put the Instant Pot lid on and make sure it's set to seal. Using the MANUAL setting, set the time for 60 minutes. Once the 60 minutes is up, let the Instant Pot pressure naturally release for 10 minutes or until there's no noise when you move the steam release valve to vent. Remove the lid, shred the pork with two large forks, and give it a good stir before serving. 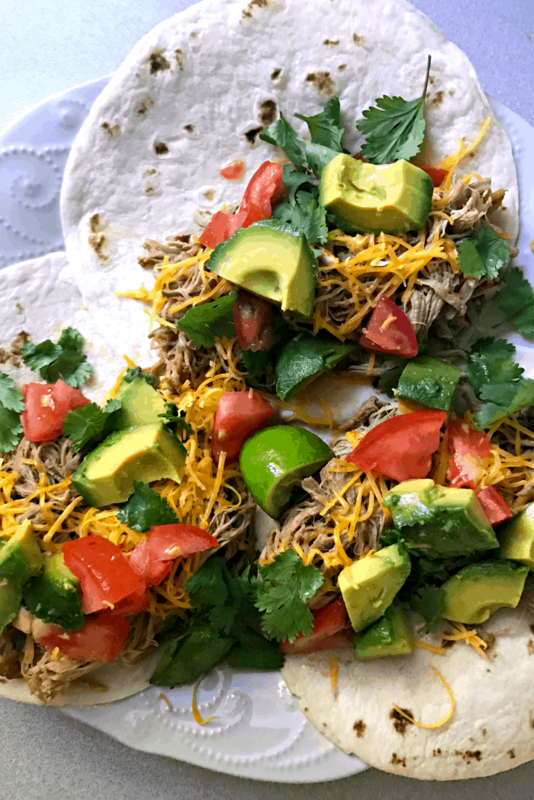 Scoop the shredded pork onto soft flour tortillas and garnish with toppings. Add a squeeze of lime if you like. Yum! I like to use the leftovers (if there are any) to make soup by adding some chicken broth, a can of diced tomatoes, chopped onions, and a handful or two of corn or hominy kernels. Sometimes I add more taco seasoning and a splash of hot sauce — it just depends on how much pork we have left. Bring it all to a boil then simmer for 6 minutes and serve garnished with more fresh cilantro leaves. Oh my gosh this looks so yummy! Mexican is definitely a huge hit in our house so will be trying this out, thanks! It’s such an easy recipe. Hope you enjoy it!